FPs are used for ion current density measurements. The ion density data are then elaborated to calculate the total beam current of the thruster, the divergence half angle and the deviation of the thrust vector. Plasma beam diagnostics is performed by rotating the boom while the electric thruster is placed at Station 1 was firing. 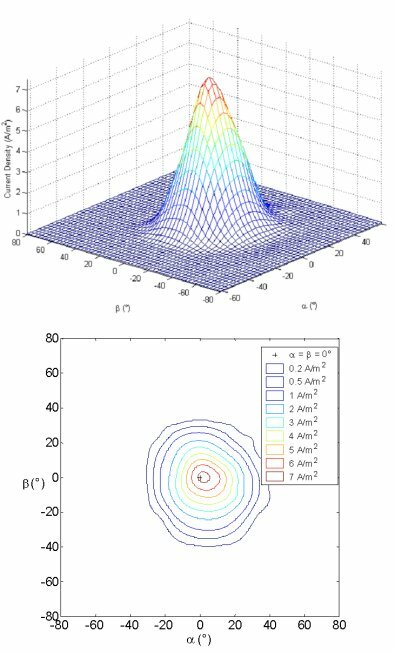 As for istance the following figure  shows current density data acquired by the probe on the horizontal plane crossing the thruster axis. It is possible to note that the data acquired during the forward boom scan (blue "x" points) are consistent with data from the subsequent backward scan (red "+" points). The following figures  show a 3D map of the current densities in the plume obtained by interpolating the probe data in a and in (angular position of the boom and angular position of a probe on the boom respectively) and the related contour map. F. Scortecci, E. Bonelli, B. Michelozzi, F. Saito, S. Scaranzin, A. Turco, PERFORMANCE OF A LARGE VACUUM FACILITY FOR SPACECRAFT PROPULSION TESTING, Aerospazio Tecnologie S.r.l., 2004.